If you've ever fancied yourself as the next DJ Shadow and don't want to be caught being a geeky gamer playing DJ Hero, then Ion Audio's Discover DJ could be for you. Showcased at CES 2010, Discover DJ comes complete with working decks which hook up to your iTunes collection, allowing music lovers the world over to become bedroom DJs. Just plug the turntable simulator into your computer and you can scratch to your heart's content. Included on the decks are bass and treble knobs, cue/sync buttons, pitch adjustments and a cross-fader for mixing two tracks together. We tried blending Johnny Cash into a bit of Basshunter and if you think that sounds rubbish, you would be right. But once an expert took over, the Discover DJ showed its true potential. 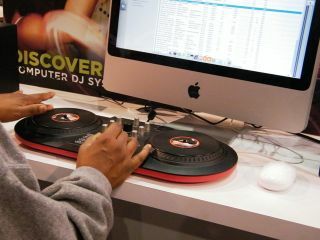 Other things you can do is beat-map your music and the setup will work as a MIDI controller for your other music apps. Discover DJ seems to be US only at the moment, but we are crossing everything we have got that it will cross(fade) over the pond soon.